Mods: propose a new sticky on "passing the co-op board." This can include wiredny members sharing their tales of the application and interview process, and a place for newbies to ask Do/Don't types of questions. Would like, in my shy, retiring way, to start with this week's New York magazine article, in which I am quoted. And other things not to say in your co-op-board interview. Getting the offer accepted is, strange as it sounds, often the easy part. It’s passing muster with the co-op board that’s tough. Assembling a killer package is key, of course (stellar references, wad of cash in the bank). Then comes the interview—and by this point, it’s your game to lose. “Ninety-five percent of the work has been done. The 5 percent is up to you, and that’s a very important 5 percent,” says Prudential Douglas Elliman broker Jacky Teplitzky. Most rules are standard—arrive early, dress conservatively—but brokers say some strategies appear counterintuitive. Take name-dropping. Though it may seem advantageous to mention friends in the building, agent Alison Rogers, author of Diary of a Real Estate Rookie, says skip it, unless you’re certain they’re adored by their neighbors. “You may score points with some, but annoy others who may not like them,” she says. In fact, steer clear of talking about anything specific about the building in general (the new fitness room or the chatty doorman). Those are what Corcoran’s Deanna Kory calls “hot points.” The gym could have come at a massive and controversial hike in maintenance; that doorman may be on his way out. “Somebody on the board may hate [them],” she explains—and your innocent enthusiasm will leave a bad taste in their mouths. Samantha Kleier Forbes of Gumley Haft Kleier once had a buyer, hoping to look interested in the future of the co-op, ask if the lobby was scheduled to be renovated. Unfortunately for him, the lobby had just been done over. “The board meeting is never the time to ask these questions,” she says. Served on the board of your old building? Resist touting your accomplishments. “That’s a big N-O!” says Teplitzky. No one likes a braggart, for starters, and you may unnerve board members who like things the way they are. I am in the process of selling a coop and my buyer's board interview is coming up. I know the building (and the board) better than my broker or their broker - is it appropriate for me to give them some advice on the interview? Sure, but with all those agents around you probably shouldn't be talking directly -- technically, you pass whatever info you want to your agent, who talks to the buyer's agent, who talks to the buyer. So the chain is this: you >> your agent >> agent repping the buyer >> buyer. The easiest way to do this is to write up a short e-mail memo that can be forwarded, but you're not going to want to make comments like "the board is very straight-laced and full of blue hairs" in writing. So unfortunately, you're probably condemned to a game of telephone. Since the info is going to passed orally, I would try to limit it to three salient points -- more than that is going to get lost. BTW, I am so excited that your deal is moving forward! I seemed to remember that you were itching to move this summer . . . Thinking about your financials when approaching a board . . .
this came to mind because I was reading another message board (I know, I know) where someone was ranting about their turndown despite the fact that they had "a house to sell" and "retirement assets!" well, that made me think that I should point out that when you are approaching a co-op, 401(k)s, IRAs, etc. DO NOT COUNT. Your ability to sock away retirement savings is a mark of character, and if you are a borderline candidate it will count for you just as a strong recommendation letter would. But it's not accessible money, and therefore, it's not money, as far as the co-op board is concerned. As a very broad generalization, when you're trying to buy a co-op, $25K in the bank is better than $250K in retirement accounts. Really? That seems so odd given you can get the money but you just have to pay taxes and a 10% vig (at least that is what I thought). Interesting.. Thanks on the other advice...yes despite all of the gloom and doom people are talking about I was able to get a full ask offer (actually had more than one). The trick was that I spent several months doing a mini renovation (refinished floors, new kitchen) and getting the places staged. Based on comparables, I got an extra $50-75K by spending $25-30K including reno, staging costs and carrying charges. Also, the place did not stay on the market long at all (got my first real offer in week 2) as it looked great online and showed well in open houses. Now I just gotta hope the coop board accepts! Don't talk about relatives that may visit and stay with you. Definitely don't say your parents might come stay for a few months at a time. I do not agreed with you. Any way, your ideal make me thinking about some thing for my project. Last edited by jerryvn01; July 31st, 2010 at 12:03 PM. Hell no. What next, a body cavity search? No long chats with the doorman.No umbrellas or wet boots in the hall. No welcome mats or decorations on the front door. No wearing flip-flops in the lobby. These are but a few of the more extreme rules that apartment boards in New York City have imposed, or at least thought about imposing, on the residents of their buildings. 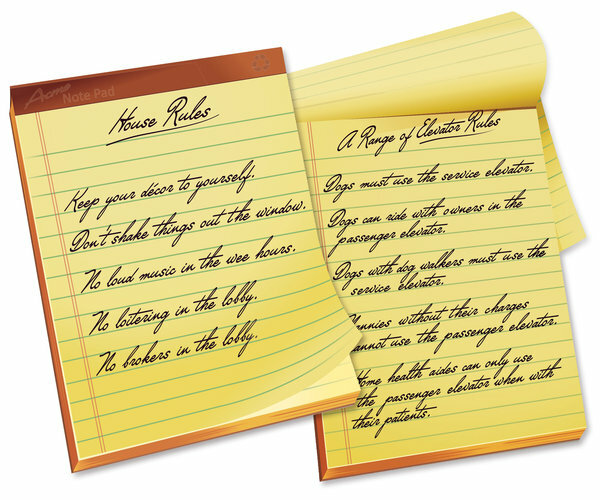 The average co-op or condominium has two dozen house rules. “Typically, they’re quality-of-life rules meant to benefit everyone in the closed community,” said Toni Hanson, a vice president and senior managing director of Douglas Elliman. While there’s good sense behind many of these rules — don’t hang or shake things out the window; lay off the stereo before or after a certain hour — certain strictures can charitably be described as quirky, not to say capricious or overreaching. Your home is your castle? Think again. It’s all, of course, in the interest of helping a building full of strong-minded New Yorkers coexist in (relative) harmony. Co-op boards have long issued directives about deportment and decorum, and condo boards are increasingly following suit. For the most part, they are well within their rights. Residents can either get with the program or get behind a co-op coup to remove the big-brother board members in their midst. Generally, thanks to what’s known as the business judgment rule, boards have broad latitude in making, amending and rescinding house rules — the good, the bad and the decidedly wiggy. If board members think a situation needs to be addressed, they can address away without input from residents. Rules tend to fall into several categories, including the use of shared spaces like the lobby or the elevator, pets and their comportment, and outward appearances — both of the apartment owner and the apartment itself. And then there’s the whole vetting process to even get into a building. For one woman, an office coordinator in her late 20s who moved into a one-bedroom in the Clinton Hill section of Brooklyn last summer, it was the application request that took her by surprise. In addition to the employment, asset, credit, reference and background checks a co-op board generally requires before scheduling The Interview, the officers of this particular building also demand that a security company check out the current residence of would-be buyers, a visit for which applicants must pick up the $50 tab. Reader, she passed muster — but remains puzzled. “I guess the board members wanted to make sure I was a regular person,” she said. Bottom line, if you want the apartment, jump through all the hoops and hope for the best.